I’m going through a thing right now. I’m not comfortable posting about it publicly yet, but promise a heartfelt and thoughtful post when the whirlwind calms down. In the meantime, I want to introduce you to Claire. Claire is my “lovey” (otherwise known as a “comfort object”). I am a logical and intelligent adult, and I generally don’t accept the idea of a lovey, but having Claire with me 24/7 right now is helping to ground me and keep my attitude positive. I keep her nearby all of the time – on my desk while at work, next to me on the couch or on the coffee table in the evening while I relax, and tucked in between me and my pillows, sometimes even in my hand, while I sleep in bed. She fits perfectly in my purse when I leave the house. Ryne found Claire a few weeks ago at Toys R Us on a quick trip to see what they had left right before they closed their doors forever. The idea of an adorable plush companion who represents positivity and my ability to get through this current struggle in my life was empowering and comforting, and so Claire became my lovey. I’m dealing with something that is completely out of my control, and having a constant reminder nearby to keep my energy positive and to hope for something magical to happen is welcome and healing for me. I’ve always prided myself as someone who can get through anything. I’ve overcome so many struggles alone. I’ve always been my own strength, rarely leaning on others. But now I have Ryne in my life. He’s my partner and my best friend, And I no longer have to face anything alone. Claire reminds my of my own strength, of my ability to rely on both myself and on Ryne, and of the fact that sometimes things really do go right. She can’t fix my situation, she’s not a magical item, and she doesn’t promise a positive outcome to this struggle, but her presence can help me keep positivity and hope at the forefront of my mind. Have you ever turned to a lovey to help yourself cope with a difficulty? Feel free to share your experience in the comments! 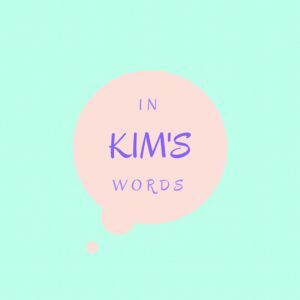 Remember to Like/Subscribe/Follow In Kim’s Words to learn more about what’s going on in my life. I’ll share the full story of this struggle after it has resolved, and Followers will be the first to know! I have two adorable kitties – Arthur & Chewbacca (Chewie for short) – are are my loveys. I also have a lamp cat given to me by a dear friend. It hangs over the arm of this swing lamp and is always adorable. I have breakfast with her every day. I never thought of her as a lovey, but I think that is what she is. Will send pic if I can figure out how to do that on the blog (might not be possible).